The beginnings of rock and roll were a wild and crazy teen-age revolution, when artists like Elvis Presley and Buddy Holly began making black music safe for white audiences. But after half a century of Led Zeppelin, the Ramones, Michael Jackson and Run-DMC, the old days can&#146;t help but look a little silly. 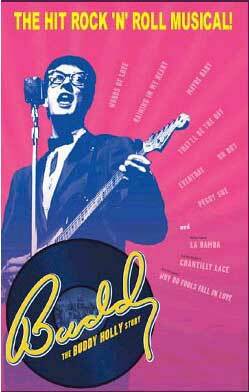 Buddy: The Buddy Holly Story, a theatrical tribute to the Rock & Roll Hall of Famer who died in 1959 in a plane crash, is bound by its own rigid mantle of nostalgia. You&#146;d better be in love with the music or you&#146;re going to hate the show. Buddy, the Rock &#145;N Roll Musical, first produced in 1989 and popular in London and elsewhere for years, is given a perky production in its San Francisco engagement. Unfortunately, even a big, energetic cast that sings, dances and plays musical instruments, can&#146;t hide the fact that the show is as hokey as a sock hop. Grease, a similarly nostalgic exercise in Broadway-styled entertainment at least had a story going for it. In Buddy there is no suspense, no dramatic tension and not much of a plot. Buddy and the Crickets play their music, they get famous, Buddy gets married, the group splits up, and then he dies. That&#146;s about it. Travis Poelle, the young actor playing Buddy Holly, is nimble-footed and lively and plays the guitar like a real rocker. He carries the familiar songs, (20 of them, from "Peggy Sue" and "That&#146;ll Be The Day" to "Rave On") with an all-American zest, and a pleasant enough voice. But the "vignettes" that are little more than transitions between numbers, offer little opportunity for him to create much of a characterization. The script is padded with extended concert sequences at the Apollo Theatre, where the group won over a black audience, as legend has it, and in the second act, Buddy&#146;s last night on earth is celebrated in a nearly 45-minute hit parade featuring not just Holly&#146;s singing, but the other headliners who went down in the plane with him: The Big Bopper (Scott Free) and Richie Valens (Davitt Felder). On opening night, audience members jumped out of their seats at the end of the show to dance with the music in a possibly nonspontaneous demonstration of joy. Buddy plays to this sentiment, but it won&#146;t make you care about the artist himself.